It had never occurred to me that setting up twelve shipping containers across the city could account for a festival, but it certainly did when the shipping containers were translated into art exhibition points. This was the Kampala Contemporary Art Festival dubbed ‘12 artists, 12 locations’ and it ran from 7th-14th October with a theme ‘12 Boxes Moving’. Contemporary art refers to art produced at this present point in time or art produced since World War II. Most well-known contemporary art is exhibited by professional artists at commercial contemporary art galleries, by private collectors, publicly funded arts organizations, contemporary art museums or by artists themselves in artist-run spaces. The KLA ART 012-festival was launched at the Uganda Museum by the German ambassador to Uganda, Klaus Dieter Düxmann who pledged his country’s support to art and the artists. The guests were welcomed by Rose Kirumira, the chairperson of the organizing committee. It has been said that sometimes contemporary art seems at odds with the public which does not feel that art and its institutions share the values of the audience. At this particular festival, it was not so much about the values but a break from the normal. 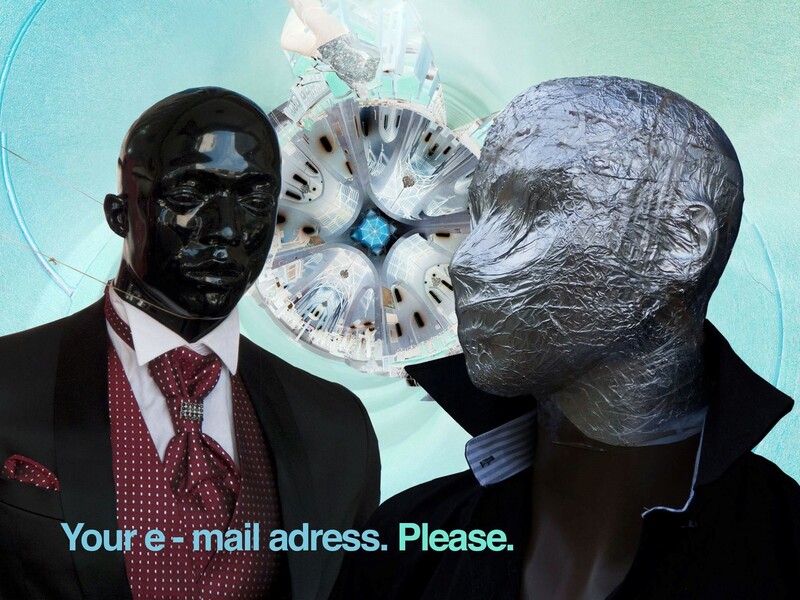 If the exhibiting artist hadn’t bothered to explain their work, it would have been close to impossible to decipher the meaning of some of the pieces. The “express your frustration”-container by Ronex Ahimbisibwe located on Eighth Street near the Mukwano roundabout was the most intriguing for me. It was a trash point of all those outrageous posters people put up like ‘for breast and hip enlargement, call this number’. Certainly the container was awash with these albeit artistically put. A waste water bottle man had been elected at the front of the container which had been reduced to just a sketch of its normal size more like a makeshift. Paper was pestered across the metallic surface as well as depictions of all Kampala’s worst potholes. The catch though was in the freedom to vent all your frustration on an innocent metallic surface without a care! This was Ronex Ahimbisibwe’s gift to the festival. A satirical portrayal of Kampala’s poor garbage disposal habits and mismanagement dubbed Truly Gifted. ‘In conversation with Emma Wolukau-Wanambwa’ located at the Makerere University Art Gallery, it was a point of education. Apparently, some worthwhile Ugandan history in relation to the Second World War had been left out of our education curriculum. Inside the container three relatively small screens stood out. 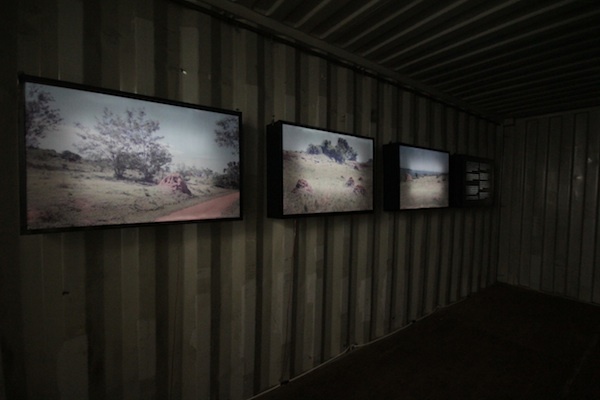 The first one depicted a semi-arid landscape, the second screen had the same landscape but with a small part of the lake visible. The third had a green landscape with a lake in the background fully visible. Emma’s presentation was artistically called Paradise depicting the place on the shores of Lake Victoria where Polish prisoners from the Second World War had been brought and kept by the British, more like a concentration camp. The British apparently wanted no mention of this repeated in history books, and that is why this piece of history was intentionally omitted from the main narrative of Ugandan history. That was Paradise for you; exploiting the changing relationship between the land, the building and the body in contemporary Uganda. In Stillness Contained or a moment of calm by Sue Crozier Thorburn at AfriArt Gallery, Sue used contrast as a powerful tool in her art through form, shape and colour. 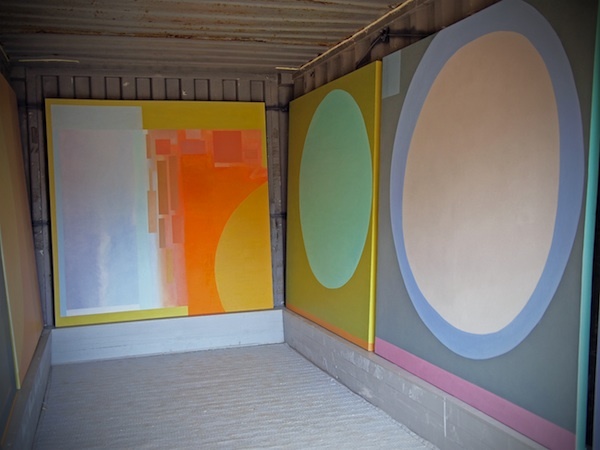 By placing large scale canvases on the walls of the container, the place was transformed into an enclosed 3D experience dictated entirely by the painting on canvas. The colours were soothing; the large mat evenly spread out and painted a light grey; the place screamed serenity and peace. The inside of the container certainly called out to all weary sojourners to drop in and find rest. ‘The only thing missing is a chair,” the retired German Ambassador Klaus Holderbaum couldn’t help but comment. Sue cited that the inspiration for her piece was the crowded and chaotic streets of Kampala. Her portrayal of calmness was in total contrast to the environment. The best thing about art is that it’s an all encompassing phenomenon. It’s no surprise then that food was a subject at the festival. In Eria Nsubuga’s My Right to be Heard, food was an issue. He created large scale sculptures of spoons painted in browns, black and burgundy to symbolize the right to food but also to symbolize the necessity to work and sculptures of noses to express the right to identity. In a world where we have food competitions, just remembered a story on NTV’s Akawungeezi, a man who galloped down 10 rolexs (10 chapatis with an egg roll each), 3 kilograms of maize paste (posho) and a large bottle of Coca Cola. Eria Nsubuga was on target, yes, and the right to food even if it could kill you! What is an arts festival without the performing arts? 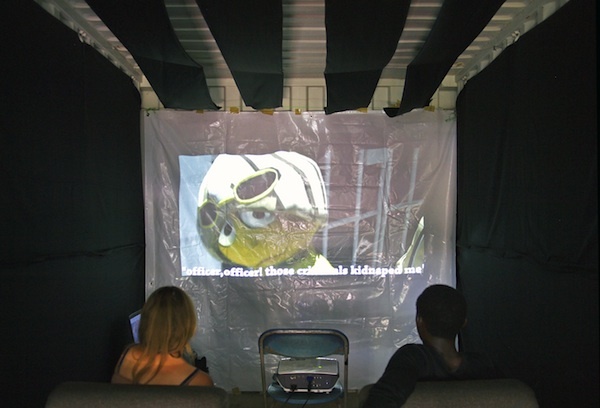 Eric Mukalazi was the only exhibiting artist in the category of film and his project was called Breezy Nuts. I swelled with pride seeing a Ugandan bold enough to make an animated film in an era when filmmaking is such a total flop in the country. The film set in Kampala was an attempt to portray a young man’s life in the city and the challenges he faces. He gets caught in a robbery and is unjustly sent to jail, a case of being in a wrong place at the wrong time. The downside to the film was that if you had not read the preview, you wouldn’t get the story at the end. Trust him to come up with one container on top of another! Maybe he wanted his exhibit to stand out of the Railway Station in Kampala city center. It was that even seated in a taxi, you could make out the one container on top of another with a trail of different coloured plastics leading up to it. On closer inspection however, it wasn’t all plastic. 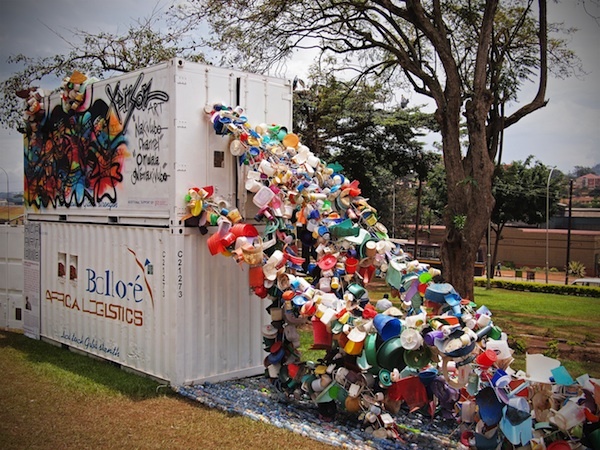 It was different objects painted to look as waste materials in a net depicting the Nakivubo channel, the title of his art project. The monumental installation as it was dubbed questioned our consumerist values and created awareness about the dangers of dumping. 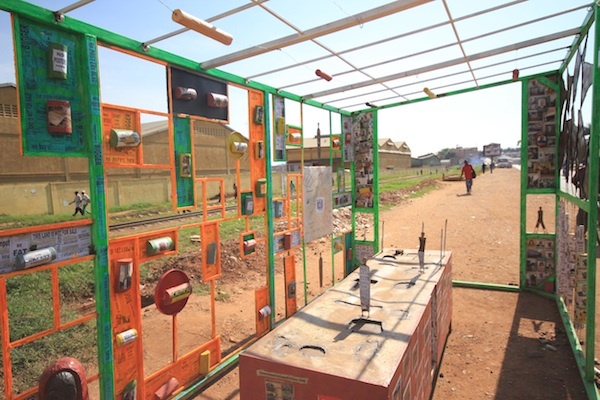 It seemed it wouldn’t have been an arts festival without Sanaa Gateja and his Uganda on the Move at Design Agenda. His presentation was of the Mombasa to Uganda railway road that opened up business at the turn of the century. He used painting, costumes and product design to entertain and educate the festival goers. Lillian Mary Nabulime and her use of sculpture in every day materials showed her commitment to fight against HIV/AIDS while Bwambale Ivan Allan explored one of Uganda’s most prominent cultural sites; the Nakyima tree in Mubende, through a series of metal sculptures depicting different elements in the shrine. Donald Wasswa and his A letter from Elephania. He managed to surround his container with beds painted in animal patterns to create a wildlife dreamscape while challenging the boundary between personal and public space. He struck me as an artist that would succeed in interior décor by the mere artistry exhibited in using black and white to give a magnificent feel inside his container. The above in addition to Stella Atal and Ruganzu Bruno were the participating twelve artists and their twelve different locations some of which are regular art venues, that showcased their work at the festival. Despite the fact that some subjects like recycling kept coming up, the festival was truly contemporary in nature and a resounding success with the festival goers. An evaluation was also in place with a panel of judges set with three awards to give away, to Ronex, Bwambale Ivan Allan and Xenson. I had a great time, looking forward to more contemporary art festivals on the Ugandan calendar. All photos by courtesy of KLA ART 012. Note: Editor Thomas Bjørnskau of startjournal.org was part of KLA ART 012’s Organizing Committee.